Broneirion01686 688204work Group HostelBroneirion is the ideal venue for family reunions, parties, celebrations, retreats and holidays. There are 20 bedrooms, sleeping up to 55, including one on the ground floor with disabled access, all individually furnished to a high standard. A self-contained flat next to the main house also sleeps a total of four,, and a camp site at the bottom of the drive can accommodate up to 100. There is ample parking next to the main house for cars, minibuses and room for coaches. Broneirion Lodge is converted to a holiday rental and can accommodate up to 6 people in double, twin (or double) and a double sofa bed in the smaller sitting room. The Lodge can either be rented independently or as part of the entire house, if available. All our meals are freshly prepared using local quality produce where possible & any special dietary requirements will happily be provided. Alternatively, you may prefer to self-cater. The large dining room seats up to approximately 35, and there is another smaller room which will accommodate a further 20. The Billiard Room can be styled to seat around 55 people. Our elegant drawing room with piano and open fire, accommodates around 40 people & is perfect for relaxation, not forgetting the Library & the Billiard Room. A large 3D T.V. & DVD is available for use, as well as a smaller set. Free Wi-Fi. Broneirion is fully centrally heated throughout, and the library, reception area and drawing room have open log fires for cosy winter evenings. Broneirion is fully licenced to sell alcohol and has a well stocked bar. Broneirion offers several flat lawn areas, plus a wooded bank with paths. There is a Camp Fire circle, and areas for lighting fires. There are a number of onsite activities to borrow or hire including archery, giant inflatable assault course, zorbs, geocaching, zipwire and a number of lawn games. A wide variety of activities and attractions are located within easy reach of Broneirion including 4 x 4 Driving, Abseiling, Archery, Canoeing & kayaking , Clay Pigeon Shooting, Farm Visits, Fishing - Coarse, Fishing - Fly, Golf Courses, Horse Riding, Karting & Mountain Biking. We also offer our onsite activities as listed above, and Broneirion is located just a few minutes walk from the Severn Way. The Billiard Room is ideal for activities in wet weather, and younger visitors will love the converted cellar where they may watch films, use the Wii and play games. Smoking: No smoking is allowed inside the house or flats. Pets: We're sorry but no pets are allowed, with the exception of Guide Dogs. Broneirion is the ideal venue for family reunions, parties, celebrations, retreats and holidays. There are 20 bedrooms, sleeping up to 55, including one on the ground floor with disabled access, all individually furnished to a high standard. A self-contained flat next to the main house also sleeps a total of four,, and a camp site at the bottom of the drive can accommodate up to 100. There is ample parking next to the main house for cars, minibuses and room for coaches. Broneirion Lodge is converted to a holiday rental and can accommodate up to 6 people in double, twin (or double) and a double sofa bed in the smaller sitting room. The Lodge can either be rented independently or as part of the entire house, if available. 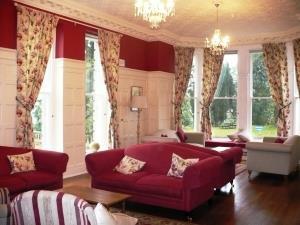 Group Rental Prices: From £1600.00 per day self-catering. We are pleased to construct a package specifically to suit your group. Please contact us to discuss your requirements. Broneirion is the ideal venue for family reunions, parties, celebrations, retreats and holidays. There are 20 bedrooms, sleeping up to 55, including one on the ground floor with disabled access, all individually furnished to a high standard. A self-contained flat next to the main house also sleep a total of four, and a camp site at the bottom of the drive can accommodate up to 100. There is ample parking next to the main house for cars, minibuses and room for coaches. Broneirion Lodge sleeps up to six (two double bedrooms and a sofa bed) and is converted to a holiday cottage to either rent separately or together with the main house. Children welcome from any age.